Signs advertising free measles vaccines and information about measles at the Rockland County Health Department, in Pomona, N.Y. The director of the Centers for Disease Control and Prevention has called on Americans to vaccinate their children against measles and other preventable infectious diseases. So has the Surgeon General of the United States. But the President of the United States? He has been silent, even amid one of the largest measles outbreaks in recent American history. Nearly 500 people have already contracted the disease, mostly in New York and its northern suburbs. Here in Philadelphia, meanwhile, a mumps outbreak at Temple University led to 140 cases; mumps has also been reported at Penn, Drexel, and West Chester University. “Silent” isn’t a term we normally associate with our voluble president, of course. And surely it’s a big improvement on his previous pronouncements, which spread the false claim that vaccines cause autism. But now is the time for the president to act, well, presidential. Ever since Franklin D. Roosevelt’s March of Dimes campaign, which helped finance research on the polio vaccine, every chief executive—regardless of party—has supported immunizations against infectious diseases. Dwight Eisenhower signed a law providing federal money for polio vaccines. Lyndon Johnson funded an immunization program against smallpox. Jimmy Carter started the National Childhood Immunization Initiative, which reached its goal of protecting 90 percent of American children. And Ronald Reagan signed the National Childhood Vaccine Injury Act, which compensated patients in the rare instances where immunizations caused harm. By contrast, Donald Trump has condemned the very concept of vaccination. “Healthy young child goes to doctor, gets pumped with massive shot of many vaccines, doesn’t feel good and changes—AUTISM,” Trump tweeted in 2014. Fortunately, that never happened. And Trump has gone quiet about vaccinations, which is better than repeating falsehoods about them. But it’s not good enough. Although all 50 states require certain vaccines for children to enter school, all but three allow exemptions for people with religious or philosophical objections. And the percentage of children who are unvaccinated has quadrupled since 2001. Not surprisingly, preventable infectious diseases like measles have spiked as well. Last Tuesday, New York declared a public health emergency to contain the measles outbreak in Orthodox Jewish neighborhoods of Brooklyn. 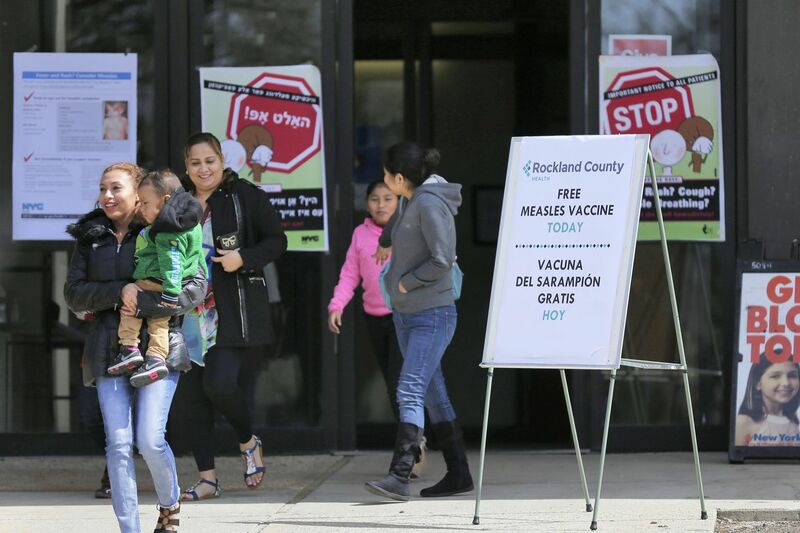 That comes on the heels of an outbreak in nearby Rockland County, which also witnessed a high number of measles cases in its own Orthodox community. Yet opposition to vaccines is hardly limited to small religious sects. It is broad and bipartisan, but higher among Republicans: in a 2014 Pew Research survey, 34 percent of Republicans and 22 percent of Democrats opposed mandatory vaccination policies. Just last month, a GOP state lawmaker in Arizona condemned mandatory vaccination as “Communist.” And in February, the wife of President Trump’s communications director tweeted that illnesses like measles and mumps “keep you healthy" and even help fight cancer. “The entire baby boom population alive today had the #Measles as kids,” tweeted Darla Shine, wife of White House communications director Bill Shine. “Sadly my kids had #MMR so they will never have the life long natural immunity I have,” she added, referring to the measles-mumps-rubella vaccine. Bill Shine was ousted from his post a few weeks later, but that had nothing to do with vaccines. And our president has ignored them, too, even as his own public health advisers have called on Americans to vaccinate their kids. That’s exactly right. But it’s hard to work together when the guy in charge is checked out. A single tweet from Donald J. Trump—VACCINATE YOUR KIDS!—would do more than anything else to protect American children right now. Let’s hope he can summon the courage and decency to send it. Jonathan Zimmerman teaches education and history at the University of Pennsylvania. He is the author (with Emily Robertson) of “The Case for Contention: Teaching Controversial Issues in American Schools” (University of Chicago Press).